Some like to read their comics in the car, at the office or even by themselves, after everyone's in bed, so they can soak in 'Bam! Boom! Pow!' in true peace and quiet. Me, I read with the stereo on, and when a song matches the book I'm reading, I think 'Crikey!' - and even write posts like this. 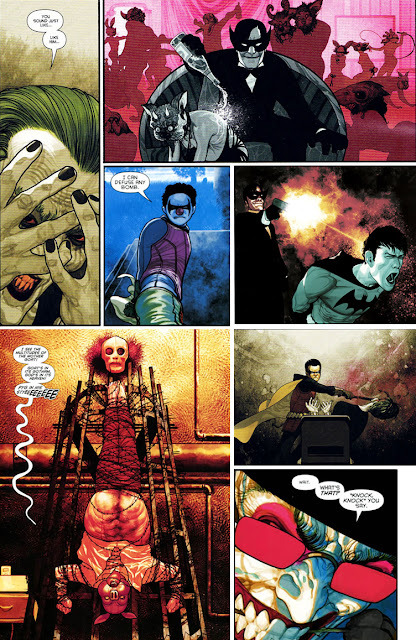 Grant Morrison and Frazer Irving's run on Batman and Robin, read like the Vertigo book the editors didn't see slip through to the printers. With Joker dancing with a bridal corpse, bizarre sexual fetishes, Pyg, and Robin's interrogation skills, the brilliantly twisted arc was one iconic number that will go down in bat-history. Meanwhile another pairing over in the world of music were exploring similar themes, with rock legend, Slash and Black Eyed Pea, Fergie's Beautiful Dangerous. The track's original video was deemed to hot for airing in the U.S., but what do you know, it airs just fine here on IADW. Now replay that as you read this remix of scenes from Batman and Robin, and you'll see that when Slash was writing the licks for his little hit, a debauched Joker may not have been all that far from his mind. one of the best depictions of the Joker I've seen in a long time. I love the detail in the face. The color work is incredible too. grant's Joker has definitely been one for the books Craig - seeing him brought to life by Frazer Irving was just beyond crazy - in a good way.